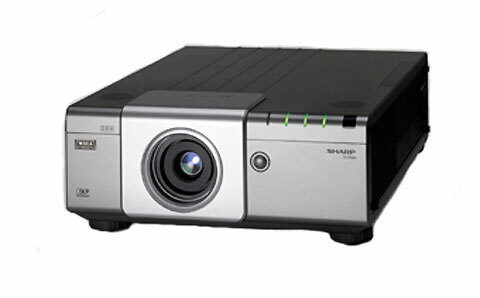 Sharp's new XG-P560W is a 5200 lumen, widescreen format projector that uses a three-chip DLP light engine and a flexible dual lamp system. With several useful lamp control options, great connectivity, and an an excellent overnight support program, the P560W is an attractive new option in the world of fixed-installation, large venue projectors. Dual lamps. The XG-P560W uses a dual lamp system, which can be used in several different ways. You can run both lamps simultaneously at full power for a whopping 5,058 ANSI lumens, as measured on our test unit. You can run a single lamp for 2,529 ANSI lumens, then switch to the second fresh lamp when the first one dies. You can run both lamps in an auto-switching mode, such that both lamps burn down at the same rate. This gives you the light output of one of the single-lamp modes, but switching is performed automatically, and you effectively get 4,000 hours before the lamps must be replaced. Or, you can run any of these operating modes in eco-Mode, adding 1,000 hours to the life of each lamp and reducing the lumen output to 4740 ANSI lumens for both lamps or 2330 for a single lamp. Since eco-mode significantly extends lamp life with much reduction in lumen output, we suspect many users will want to take advantage of it. Powered lens. The XG-P560W's stock lens, the AN-P18EZ, has a 1.29:1 powered zoom and focus, as well as powered lens shift. The shift has a range of 2.25 picture heights vertically, as well as a horizontal range of 1/3 of the picture width in either direction. All of this is controlled from the remote and is intuitive to operate. If this lens doesn't suit your needs, the XG-P560W can take six other lenses with varying zoom ranges, from very short to very long. The XG-P560WN is the projector body with no lens attached, in case you want to order a different lens at the get-go. WXGA Resolution. The XG-P560W is a 1280x800 (WXGA) resolution projector. The advantage of this format is that it can natively display several different signal format. XGA and both WXGA (1280x768 and 1280x800) computer signals can be displayed in pixel-perfect native resolution, as can 720p video. This allows for a wide range of content to be used on the P560W without resorting to scaling. It is ideal for applications such as digital signage where extremely high resolution is not needed. Great connectivity. The P560W has a good selection of inputs. In addition to DVI-D and HDMI, the projector has a VGA port and a monitor pass-through. It has a 5-BNC hookup rather than component video, but the five BNC plugs can be used for either component video or an RGB signal from a computer. Composite and s-video round out the video connections. On the audio side, each input has its own 1/8" or 2xRCA audio input, with the exception of HDMI (which carries sound already). Finally, the P560W has a wired networking connection and an RS-232C port. "Express" warranty. For the entire duration of the XG-P560W's two-year warranty, Sharp offers an "Express repair" option. If your projector breaks, give Sharp customer service a call, and they will have a working projector in your hands within 24 hours. This level of service is very useful in "mission-critical" installations, where it is vital to minimize downtime. 3W stereo speakers. Quite often we see big, bright projectors with anemic little speakers on them. The P560W is not one of them. If the conference room is not too big, the dual 3.0W speakers may provide enough "oomph" to make them an acceptable budget alternative to a dedicated speaker system. Of course, if you have speakers installed, it would be preferable to use them instead.